man, if it weren’t for her Jay Leno Chin. . .
@elzarcothepale: really? that’s the first thing you notice about her? @elzarcothepale: You don’t have to look at her chin, it will be hidden by your balls. 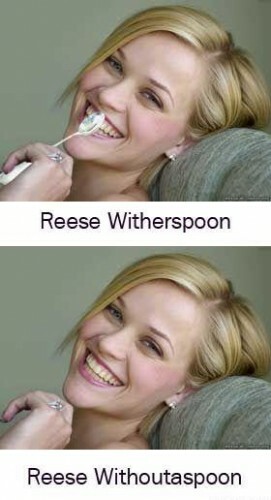 @Howie Feltersnatch: no, its Reese WithOUTmydickinhermouth. @elzarcothepale: Election was a fricken riot. Matthew Broderick Ftw! Perhaps his only good part since Ferris Bueller. Changing ‘her’ to ‘a’ = fail. Should be ‘Withouterspoon’.